When you think about Queen Elizabeth II, tablet computers aren't among the things that spring to mind. Yet here she is using one, and surprisingly, it isn't an iPad. 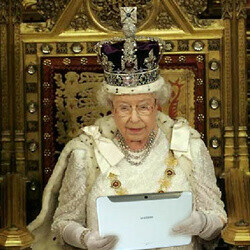 Nope, Her Majesty is handling a Samsung Galaxy Note 10.1 instead. The tablet is meant to become a part of the Queen's Royal Collection, and for the purpose, it has been equipped with what is being referred to as a "digital time capsule". That includes videos, photos, and text documents related to the past 60 years of Queen Elizabeth II's reign. About 150GB of media has been submitted by more than 37,000 participants from 66 countries, but only 60 hand-picked items have been featured. The organizers of the project admitted that they originally planned to use an iPad, but after speaking with both Apple and Samsung, they decided to go with the latter's product. "The digital nature of the project required a digital device to present to Her Majesty, and The Queen will be able to press 'play' on the tablet before watching a video of some of the best Jubilee time-capsule entries," said Danny Sriskandarajah, director of the Royal Commonwealth Society charity. Sir Johnny Ive must die of envy. So do you think the landscape nature of the Note 10.1 played a role in the presentation? I think the forward facing speakers were a deciding factor. If you've ever listened to music or watched videos comparing the iPad vs the Note 10.1 you'd understand what I mean. Front facing speakers are amazing. Well the Queen sure knows what she wants, peek a good product when she sees one,GOD SAVE THE QUEEN.and SAMSUNG too. Although I've never been a fan of monarchs. I must condone this one smart decision on the part of Her Majesty. samsung s3 commercial poke fun at iphone as being preferred by older people, well the queen aint that young. This is a very clever but obvious bit of Photoshop editing. I guess now we have to refer to this device as.... "Sir Note" 10.1. ;) ... Its been Knighted. im from the uk and i think your generalising way to much but basically when an older person chooses apple its proof its for the old, when they choose android there smart.......thats basically how you see it. fanboyism overload on here besides she doesnt use a note 10.1. You mean she doesn't use "Sir Note" 10.1. (Its been knighted). We shouldn't trust any surveys that doesn't show Apple in good light ... i see this as an extension of consequences of Apples courage to insult UK's court order. And we shouldn't listen to retards who claim that Android is chosen by people who can't afford Apple. Or is her majesty destitute? This is what happens when Apple insults a nations court. See. Its the poor people who can't afford an iPad who but these cheap, plastic, buggy, laggy Android products. If the Queen of England could afford it, she'd have chosen an Apple product. Lol, that's actually pretty cool.